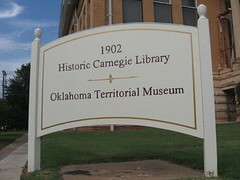 Built in 1902 with a grant of $25,000 from Andrew Carnegie. 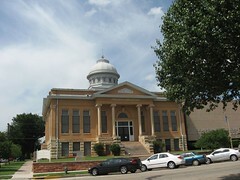 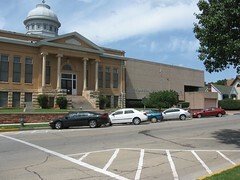 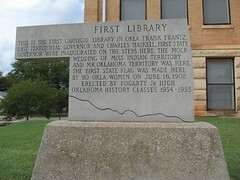 It housed the first tax supported library in Oklahoma. 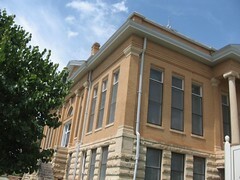 It was the site of the inaugurations of Territorial Governor Frank Frantz in 1905 and 1st State Governor Charles N. Haskell in 1907. 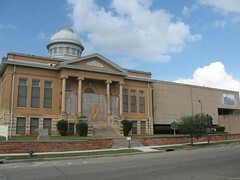 Scene of many public and club meetings the building was the meeting place for the Betsy Ross Society's women who sewed Oklahoma "46th Star" U.S. flag after statehood. 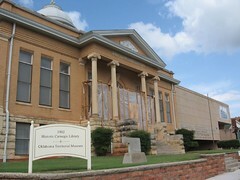 It was given by the City of Guthrie to the Oklahoma Historical Society in 1969, entered in the National Register of Historic Places 1971 and opened as Oklahoma Territorial Museum Nov. 13, 1973. 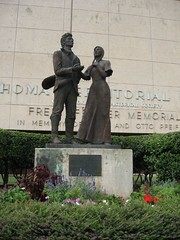 Created by Frederick A. Olds depicting the symbolic wedding uniting Miss Indian Territory and Mr. 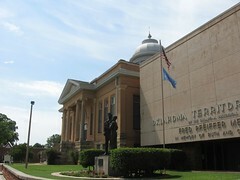 Cowboy Oklahoma on Statehood day , November 16, 1907, this "Wedding" symbolized the twin Territories coming into the union as one State. 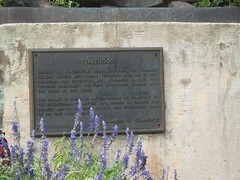 This plaque is given as an expression of gratitude to the Bi-centennial committee who worked to finance this project and to Frederick A. Olds who generously gave of his time and talent.